Here is another image (copyright: Keren Manor) that conveys the situation of Palestinians – these ones Palestinian citizens of Israel – more completely than any words. 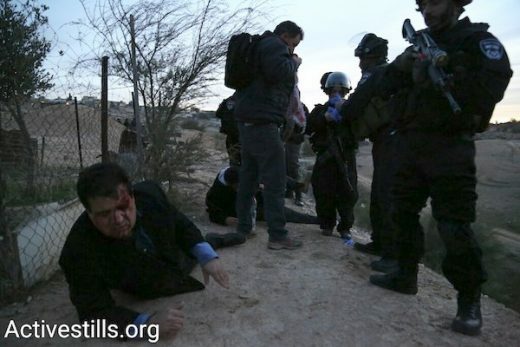 The man on the ground is Ayman Odeh, a member of the Israeli parliament, the head of the Joint List, the third largest party in the parliament, and the highest-ranking Palestinian politician in Israel. Israeli police have just shot him with rubber-tipped bullets, not once but twice – including to the face. Odeh is one of the least confrontational politicians among Israel’s large Palestinian minority, a fifth of the population. His message is consistently one of peace and amity between all Israeli citizens, whether Jews or Palestinians. That does not seem to have protected him from the shoot-first, ask-questions-later approach of Israel’s security forces towards Palestinians. This image should be as shocking as seeing a bloodied Bernie Sanders or Jeremy Corbyn crawling in the dirt, watched impassively by US or UK police. Context is important too. Odeh had joined the 1,000 inhabitants of Umm al-Hiran – all Palestinian citizens of Israel – early this morning in a demonstration to stop demolition crews destroying the 150 homes of their village in the Negev. Israel allowed these families to move to the area of Umm al-Hiran in the 1950s after it had driven them from their original, and much more substantial, lands during the Nakba. The pretext then for expelling them was that Israel needed their ancestral lands for an exclusively Jewish kibbutz. That all occurred during a military government that ruled over Israel’s Palestinians for nearly two decades. More than 60 years later, exactly the same thing is happening again, but this time in front of the cameras. Umm al-Hiran is being destroyed so that an exclusively Jewish community, with the same name of Hiran, can be built over these families’ homes. Israel never issued Umm al-Hiran with a master plan, so now it can be declared illegal and its inhabitants called “squatters” and “trespassers”. The families are being ethnically cleansed a second time – not during hostilities or in a time of war, but by their own state in a time of peace. They are far from alone. Thousands of other families, and their villages, face the same fate. The truth is nothing has changed from the 1950s. Israel still behaves as if it is ruling militarily over its Palestinian citizens. It is still a Jewish state, one that privileges the rights of Jewish citizens over Palestinian “citizens”. It still treats all non-Jews as a threat, as an enemy. Israel is not a normal kind of state. It is an ethnocracy, and one driven by an ideological variation of the ethnic nationalisms that tore apart Europe a century ago. Odeh is a leader who campaigns for peace and equality between Jewish and Palestinian citizens. Today, he got his answer. His place is bruised, bloodied and bowed, crawling through the dirt. This is the language of a Jewish state. Jonathan Cook, based in Nazareth, Israel is a winner of the Martha Gellhorn Special Prize for Journalism. His latest books are Israel and the Clash of Civilisations: Iraq, Iran and the Plan to Remake the Middle East (Pluto Press) and Disappearing Palestine: Israel's Experiments in Human Despair (Zed Books). Read other articles by Jonathan, or visit Jonathan's website. This article was posted on Wednesday, January 18th, 2017 at 11:56pm and is filed under Israel/Palestine, Police.